No matter the workplace, problems arise every now and again. Work culture plays a large role in how problems are resolved and how employees handle the situation. Those in positions of power set the tone for the rest of the organization. The key to improved team productivity and improved problem-solving is genuineness. Genuine leaders who facilitate a culture of genuineness are more effective in their roles. Their behavior produces a better work environment for team members to thrive. With the following team building strategies, genuine leaders can build both team genuineness and productivity on the team. Genuine leaders create a culture of open communication. Genuineness starts with communication. If team members don’t feel comfortable talking with leaders about issues that affect their work, then their positions also do not feel safe. Safety and the opportunity to be candid are required to produce quality work and high productivity. A culture of open communication is so important that without it, top performers are unable to obtain needed resources to remain productive. Highly productive employees know who to go to and how to ask for help. They also ask the right questions of the right people to perform to the best of their abilities. None of this can happen without a culture of genuineness that focuses on creating a safe and open environment for team members to ask questions and share opinions without fear of ridicule or repercussions. If team members are unable to bring their observations and problems forward, then problems get swept under the rug. Or, employees become disengaged and their work suffers. When problems are ignored, the problem eventually becomes a customer service and customer retention issue, and the end product suffers. Genuine leaders demonstrate desired outcomes. Change starts at the top. If genuine leaders desire an open culture but don’t already have one, start with the CEO and the leadership team. Employees won’t know how to be genuine if the CEO and executive team aren’t. They also will not place value on open communication if the top leaders in the company don’t place value there. The best way to implement change is by first creating a new strategy with actionable tasks, milestones and goals. Then communicate the desired change, the reasons behind the change and the desired outcome. Then as leaders demonstrate how these changes play out in day-to-day operations, team members learn how to implement these changes, too. If leaders come from a place of genuineness, they will reduce team member hesitations and conflict during change execution. The result is increased productivity and genuineness throughout the company, which is measurable for return on investment. Sometimes leaders need more guidance and training to better exemplify genuineness. Genuineness is the key to solving problems, improving systems and streamlining operations. Facilitating genuineness can be problematic if the manager is not skilled in group facilitation methods. When the team generates ideas and strategies for improving genuineness, there is enhanced accountability and commitment for the outcome. This is where proper training comes in. Good manager facilitation methods release leaders from the unreasonable expectation that they must know everything. Leaders are able to solve very complex problems with employee buy-in and support when different perspectives are laid out for everyone to see. When good employee facilitation is paired with fact checking and follow-up perspective narrowing and planning, commitment for the outcome is enhanced. When managers become good facilitators, generally the group dynamic improves. Organizations typically report measurable results from their Profit and Loss statements through cost savings or productivity improvements. 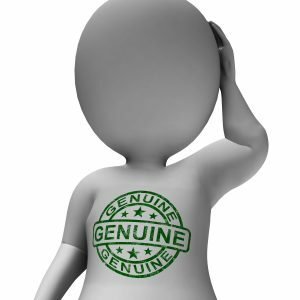 The question now is, could genuineness be a group dynamic problem for your company? Is it possible in some departments and not in others? The way to know is to measure. 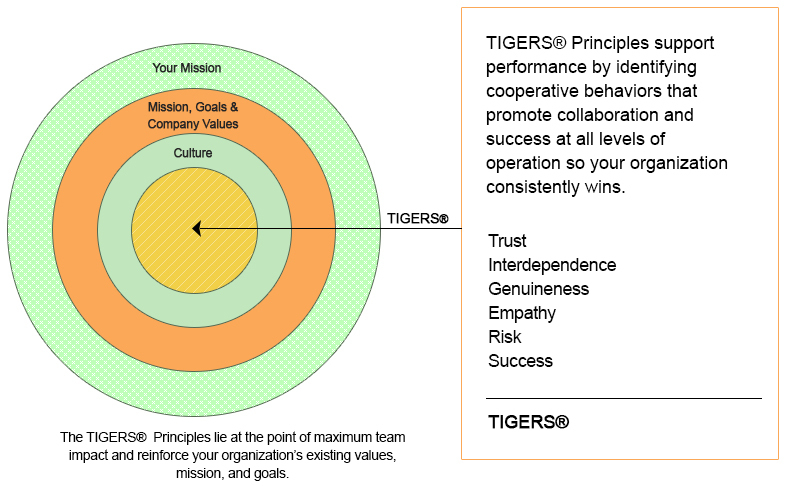 The TIGERS Workforce Behavioral Profile™ is an assessment that measures whether employees believe that they can be genuine in their departments and company-wide. When the results of this assessment are known, CEOs and the Executive team have the information they need to train and develop staff, and perhaps assign coaching to key leaders if their department scores are low. A sample copy of a company report broken down by department is available here. Genuineness is a key element for problem solving, as well as employee productivity. Without a culture of genuineness, problems are likely to be downplayed or even ignored. This conveys the message that employees and their problems are not important to their leaders or the company and work quality is optional. Teaching leaders to be genuineness facilitators through proven training resources. With the proper strategies, leaders can create a culture of genuineness that produces highly productive team members and work quality outcomes. Consider the following articles and resources to add to this genuine leaders conversation.